I am undergoing a root canal. I went through the supposedly worst part last week, and what did i find out? Well, it was not that bad. Mentioning the word Root Canal brings out the sympathy from everyone, but as I found out, the fears were unjustified. It essentially comprises of cleaning up the infected nerve from inside the root canal. The dentist uses files - essentially like the soft-board pins - to clean up the inner part, and once every bit of muck is out, then some sort of rubber is inserted in the newly created hole, and sealed with some quick setting cement. This is the temporary cap. Next comes the permanent cap. That's it. The tooth's as good as new. When I heard of the blasts in Hyderabad on TV, I got on the phone to my S-I-L and a very close friend there. The surprising part is that both of them were unaware of such an incident taking place. Its almost as if the TV news channel knew of them, even before they occurred. Looking at the levels they can stoop to raise TRP's I wouldn't be surprised if one of the news channels knew about it before hand. The gory-ness of the entire coverage has reached new heights. (or is it depths). They are now using shock value to raise viewership. I miss those old B&W days. One thing which I fail to understand is, who are these against? I can understand if its done by Religion A versus Religion B. But here, the victims are of both religions!!! Who stands to gain from such deed? Surely not the terrorists. The shock value only lasts for days. Public memory is short. The government? I don't think so. The ubiquitous foreign hand? Maybe, but isn't it obvious? But one thing is for sure. Someone's life has changed... forever. 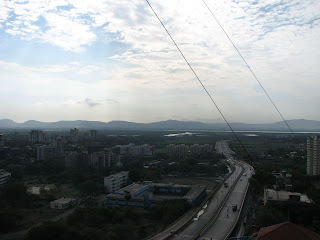 For those who do not know, I live very near to IIT Powai, just before the Gandhinagar Signal. 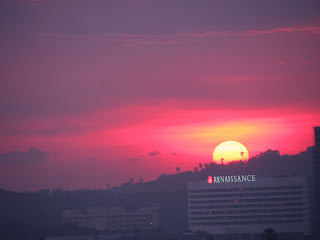 This photograph showcases the Renaissance Hotel in Powai. This lake stands on the edge of the Vihar lake, making it the only lake side property in Mumbai. Now, this works both ways. Splendors want to race with me. Auto guys give way. Pedestrians stare. And most strangely, some people taunt. Have heard people calling out aaaay rider, John, dhoom, and i guess many other names which i didn't hear. I am an armchair rider. 90% of my riding is done while commuting from Home to office and back. The rest is done on the online forums. Does being a armchair rider help? As comes from my experience today morning, it does. I was caging it to work today morning. As usually, the roads were muddy, and with heavy traffic. I was in the second lane, with a biker to my right. In front him was a Scorpio. Suddenly he tried to pass between the Scorpio and my car. 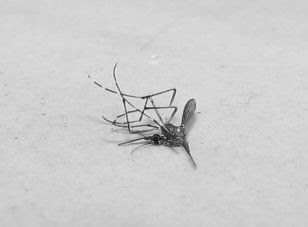 At that moment, the scorpio braked and this bugger went straight into the scorpio. He hit the scorpio and fell right in front of me. I had already stopped by the time he crossed over to my lane. Thankfully, it was a low speed crash and all he had to show was a muddy pair of pants. Point is that something told me that things were not going right. And I presume that it is because of the awareness built by reading so many posts and mails about safe and defensive driving. 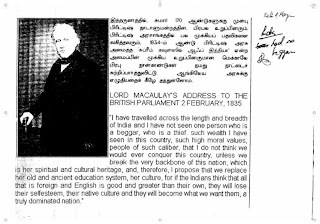 Lord Macaulay’s address to the British Parliament in 2 February, 1835. I have traveled across the length and breadth of India and I have not seen one person who is a beggar, who is a thief, such wealth I have seen in this country, such high moral values, people of such caliber, that I do not think we would ever conquer this country, unless we break the very backbone of this nation, which is her spiritual and cultural heritage, and, therefore, I propose that we replace her old and ancient education system, her culture, for if the Indians think that all that is foreign and English is good and greater than their own, they will lose their self esteem, their native culture and they will become what we want them, a truly dominated nation. If this is true, then they have succeeded. And how!!! 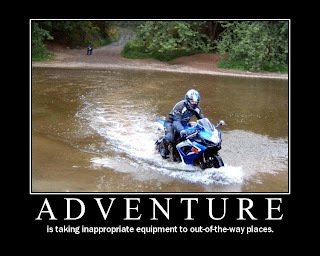 Rain rain, go away, come again, another day..
Click here for a great set of motivational posters, just for bikers.